Citation Information: J Clin Invest. 2004;113(8):1118-1129. https://doi.org/10.1172/JCI19205. Gene-based delivery can establish a sustained supply of therapeutic proteins within the nervous system. For diseases characterized by extensive CNS and peripheral nervous system (PNS) involvement, widespread distribution of the exogenous gene may be required, a challenge to in vivo gene transfer strategies. Here, using lentiviral vectors (LVs), we efficiently transduced hematopoietic stem cells (HSCs) ex vivo and evaluated the potential of their progeny to target therapeutic genes to the CNS and PNS of transplanted mice and correct a neurodegenerative disorder, metachromatic leukodystrophy (MLD). We proved extensive repopulation of CNS microglia and PNS endoneurial macrophages by transgene-expressing cells. Intriguingly, recruitment of these HSC-derived cells was faster and more robust in MLD mice. By transplanting HSCs transduced with the arylsulfatase A gene, we fully reconstituted enzyme activity in the hematopoietic system of MLD mice and prevented the development of motor conduction impairment, learning and coordination deficits, and neuropathological abnormalities typical of the disease. Remarkably, ex vivo gene therapy had a significantly higher therapeutic impact than WT HSC transplantation, indicating a critical role for enzyme overexpression in the HSC progeny. These results indicate that transplantation of LV-transduced autologous HSCs represents a potentially efficacious therapeutic strategy for MLD and possibly other neurodegenerative disorders. Chimerism and hematologic reconstitution by transgene-expressing cells of transplanted mice. (A) FACS analysis of GFP expression in control (left panel) and transduced (right panel) purified progenitors. (B) GFP expression in PBMCs of primary and secondary transplanted mice, 3 months after BMT. Up to 90% of circulating donor CD45.1-, CD11b-, B220-, CD4-, and CD8-positive cells expressed GFP. The means and standard deviations of primary (n =16) and secondary (n = 4) mice are shown. 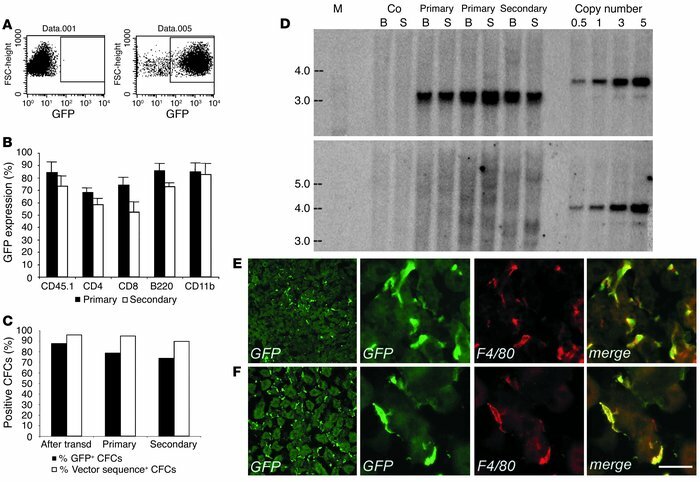 (C) GFP expression by fluorescence microscopy (% GFP+) and transduction level by PCR (% vector sequence+), in CFCs from progenitors after transduction and from BM of primary and secondary recipients (50–100 CFCs scored for fluorescence and 20 CFCs analyzed by PCR per each mouse, n = 9). The great majority of CFCs contained LV sequences and expressed GFP along serial transplants. (D) Southern blot analysis of bone marrow (B) and spleen (S) DNA from transplanted mice. A standard plasmid curve, from 0.5 to 5 vector copies per genome, DNA markers (M) in kb, and control untransplanted mice (Co) are shown. AflII digestion (upper panel) showed 5 or more vector copies integrated per cell in all recipients. BamHI digestion (lower panel) showed a diffuse hybridization pattern in primary mice indicating oligo- to polyclonal engraftment and the absence of dominant clones. (E) and (F) GFP+ cells in liver (E) and kidney (F) sections of transplanted mice, 3 months after BMT, stained as indicated. GFP+ cells expressed F4/80 (3 panels on the right). Scale bar: 20 μm.